In this Start-Up or Refocusing Plan, there will be much research and thought behind each of these 9 sections, with much detail written down. As a result, this plan may be anywhere from 25-75 pages in length. As mentioned, when most established business owners think of a “Business Plan” this is what they have in mind. As a result most feel overwhelmed and paralyzed, concluding that their time is best spent just getting the work done. While I believe that this type of analysis and detail is critical in a startup or major transition, I do not suggest that business owners try to tackle this much detail every year. I recommend an Annual Growth Plan instead. A Financial Plan – which is a budget projected out by month for the next 12 months. You will want to project your income and your expenses for each month. As you proceed through your year you will evaluate each month’s actuals to its budget/projected. By doing this you can make adjustments as necessary as you go through the year. An Operations Plan – which takes into account the 7 basic processes in every business. Goals are then set to improve each of the 7 processes. This Annual Growth Plan is no more than 3 pages (one page for each section) and can be completed through our guided process in just a few hours. This should be completed every year, and then performance should be tracked against the plan. Scenario Planning is a technique that is used when a company is in a rapidly changing or an unpredictable industry or environment. I guide business owners through a process centered around the “critical drivers” (those 2 or 3 things that will determine the future) and probabilities. Using this technique, business leaders are able to create the 3-5 most likely scenarios of the future and then map out a tentative plan of action for each scenario. This is not exhaustive but it gives the business owner an immediate starting point and plan of action if/when the scenario takes place. I have found this approach very helpful in the past couple of years working with people in the health insurance and health care fields. Much more can be said about each of these. 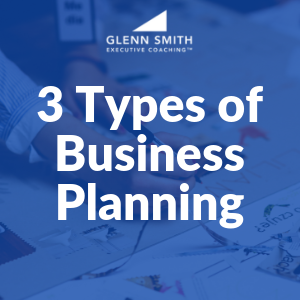 However, this should give you a basic overview of how you can begin thinking about business planning. Are you looking for some guidance in what kind of planning you should be involved in? Contact us today to see how we can help! How to Run a Growing Business is our flagship course for business owners who are ready to take their business to the next level. It contains everything you need to know about creating a scalable, profitable, turn-key business in this online course. 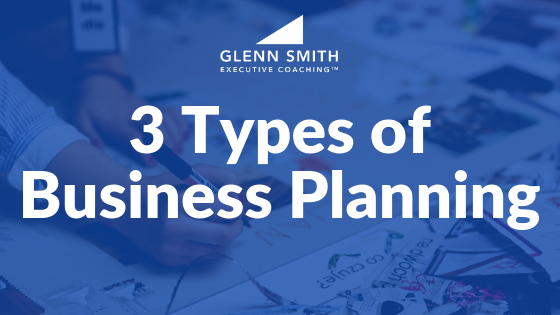 There are 3 types of business plans that owners, executives, and managers use. Each has its own purpose and specific application in your business.